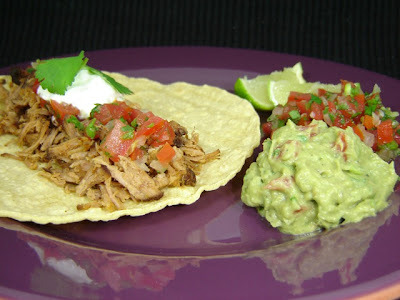 I saw these tacos on a recent episode of Mexican Made Easy on Food Network. I have tried so many yummy recipes from that show. 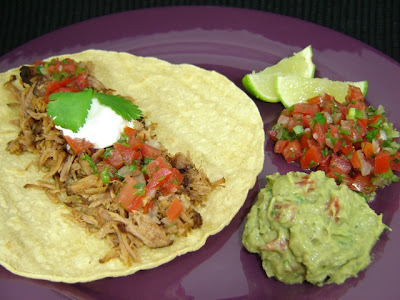 On this same episode with these tacos, I saw another recipe that I also tried this week and it was super yummy too. The recipe for these tacos call for short ribs and it is not always easy to find short ribs where I live. The store that I had seen them at before says they only have them every once in a while, which was not right now. So, I had to use boneless pork ribs instead of short ribs, which was perfectly fine, because these tacos turned out really good. I baked mine in the oven instead of in the crockpot, because it is a few hours faster. When your meat is cooked, you are supposed to shred it in the sauce, so it is super juicy, but I might have cooked mine slightly too long, because my liquid was completely absorbed? So, I just added a little beef broth and my meat was still moist and flavorful. I served in corn shells with fresh salsa, sour cream and a cilantro with guacamole on the side. Very Very Yummy! I found the dried ancho chiles in the Mexican section of my grocery store. A package of 4 dried chiles was around $2. Soak ancho chiles in boiling water until softened, about 15 minutes. Drain and discard liquid. Remove the stem, seeds and ribs. Transfer chiles to a blender. Add onion, garlic, brown sugar, vinegar, beef broth, 1 tsp. salt and 1 tsp. black pepper. Puree until smooth. Pat dry ribs and season with salt and pepper. Heat oil in large oven-safe pot over medium-high heat, but not smoking. Brown ribs, about 7 minutes. Pour sauce over top (should be halfway up the meat). Cover and cook in a 350 degree oven for about 3-3 1/2 hours or until very tender. Remove from oven and allow to cool slightly in the sauce. Remove ribs and discard bones (if you have them) and fatty parts. Shred meat and add back to the sauce (or if your sauce evaporated, add a little beef broth). Season with salt and pepper, if needed. Serve in corn tortillas with fresh salsa, sour cream and chopped cilantro. You can also cook the ribs in a slow-cooker, on low, for 7 hours or until tender. What a fresh taco dinner! I love me some Mexican! I could probably bathe in Guacamole! Thanks for sharing this recipe. Looks delicious!